Garage doors can be costly to replace when they become faulty. However this expensive option can often be avoided by having your garage door repaired. What security benefits are gained when choosing a reputable repair company to mend your garage door? Garage doors can sometimes become damaged or fail to function as they should. Some home-owners grow concerned at the costly prospect of having to replace their garage doors. It may be tempting to repair the door themselves. However, the lack of appropriate tools or skills can result in the door become less secure. Heavy wooden or metal repairs may weigh the garage door down and cause strain to the door’s fixtures and fittings. It may also become an eyesore and attract disparaging looks. However, worse than this, an ill-repaired garage door may harbour unwanted attention and encourage criminal activity because the door has a weak-spot that can be easily accessed. A repair carried out by an experienced professional will prevent unwanted attention because the integrity of the garage door structure will no longer be compromised. The quality of the workmanship and materials used will provide a secure solution. A professional repair will also safeguard any interior doors that may be accessible from the garage. A garage door will often last for decades which means that it is no longer suited to our needs as our lifestyle evolves. There may be occasions when your existing garage door can no longer be repaired. If this is the case, you have the opportunity to choose another type of door which may be better suited to yourself and your family. Perhaps your garage door became damaged because it was not the correct type of garage door for you, for example, you struggled to reach the door to close it. This problem can now be averted because there are many types of garage door presently available and one is bound to meet your requirements. A garage door which is ideal for people with limited movement or mobility issues is the side hinged garage door. This can be installed with a “split” positioned on either side, as well as a central or off-centre split. Its side hinges ensure that it is easy to use for everyone because there is no heavy lifting required. This is unlike most garage doors where you need to be able to reach the garage door from a significant height to pull it down and secure it shut. Another great option is an automated garage door which can be opened or closed at your convenience. Once you push a button on the remote control to open the garage door, you can drive straight in without having to exit your car. Both types of garage door are excellent choices if you struggle to gain access when using a typical garage door. The side hinged garage door and the roller garage door are perfect options if you have a small garage and do not want the garage door to impinge on space. A side hinged garage door can be used despite the height of the garage or if there is internal shelving inside. 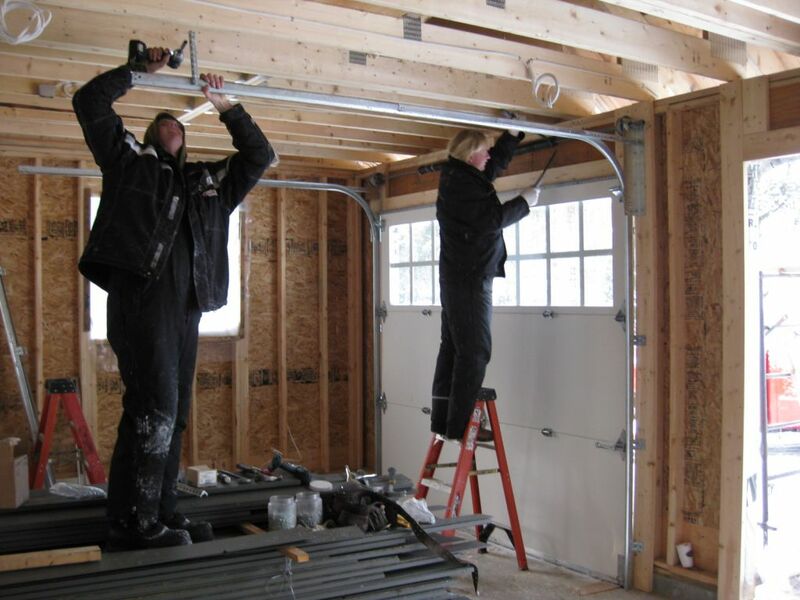 The roller garage door is similar in this regard and can still function even if there is limited roof or wall space. These garage doors are ideal if you use your garage as a home office, gym or extra bedroom and want to capitalize on the space available. The roller garage door is also helpful if you have a short drive because it has no outward swing, ensuring that it uses the smallest amount of space possible. If you are on a budget, up and over garage doors offer high functionality and quality at great value. The canopy version of the up and over garage door is the most basic choice. Its door forms a canopy when open by creating a 2 foot overhang from the door frame. The retractable option does not protrude but is a better choice if you want your garage door to be automated. Up and over doors have a basic design and are very easy to maintain which ensures that they are highly cost effective. Wooden garage doors and sectional garage doors are very striking, elegant choices. If your garage door requires replacing, you might want a stylistic overhaul by choosing one of these garage doors. The sectional garage door has horizontal hinged sections which slide vertically and rest inside the interior roof of your garage. This intricate and beautiful structure is highly appealing. Its robust construction ensures the protection of items kept in your garage. Wooden garage doors are equally sturdy and reliably secure. They are highly autonomous: you can choose from a wide range of woods, finishes and glazes which make them a great choice for many and suitable for all types of homes. Garage door repairs are imperative to provide a safe environment to store your valuable or sentimental belongings. A cost effective repair service is the best way to ensure that you have a secure garage once again. However, if it is not possible to repair your garage door, there are many cost-effective alternatives which guarantee that the security of your garage is upheld.